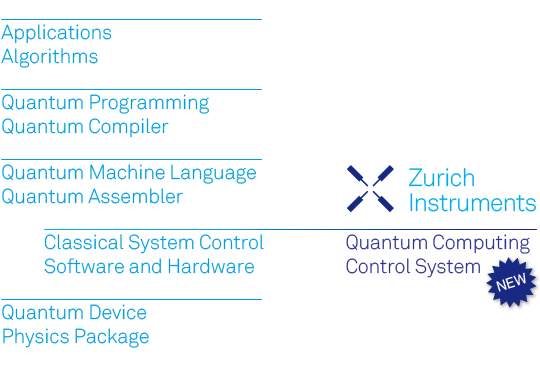 Zurich Instruments is intent on contributing with the finest electronics and software to enable our customers to scale efficiently to a large number of qubits while keeping the complexity at bay. We believe that the efficient and well-orchestrated interplay between the required instruments gives our customers a key advantage, linking high-level quantum algorithms with their physical qubit implementation. 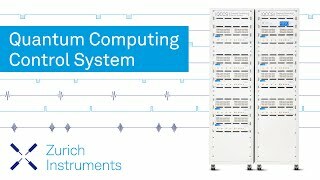 Zurich Instruments now offers the first commercial Quantum Computing Control System (QCCS) which is equivalent to the layer labeled "Classical System Control, Software & Hardware". This part of the stack ensures reliable control and measurement of the quantum device while providing a clean software interface to the next higher level in the stack. Hardware specifications match the application: Low noise, high resolution, and ample bandwidth. Ready to scale: Compact design. You can add channels at any time. A well thought through & tested systems approach: Precise synchronization and sophisticated orchestration of all input and output channels. Productivity-boosting software: Our LabOne® software efficiently connects high-level quantum algorithms with the analog signals of the physical system. 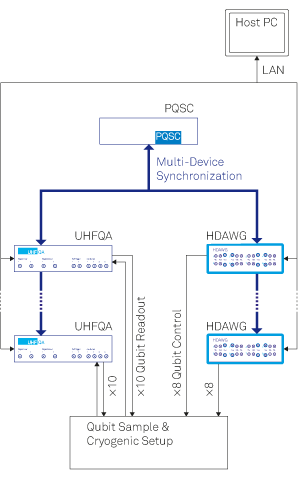 The Programmable Quantum System Controller (PQSC) synchronizes and controls up to 18 HDAWGs. The UHFQA Quantum Analyzer reads out up to 10 qubits simultaneously using state-of-the-art filter technology. The HDAWG is a very compact 8 channel high-density AWG for qubit control. Check the product page or contact us directly to start the conversation. The Zurich Instruments UHFQA Quantum Analyzer is a unique tool for parallel readout of up to 10 superconducting or spin qubits with highest speed and fidelity. The UHFQA covers a frequency span up to ±600 MHz, with nanosecond timing resolution. It features 2 signal inputs and 2 outputs for IQ base-band operation. Thanks to its low-latency signal processing chain of matched filters, real-time matrix operations, and state discrimination, the UHFQA supports a roadmap for ambitious quantum computing projects with 100 qubits and more. 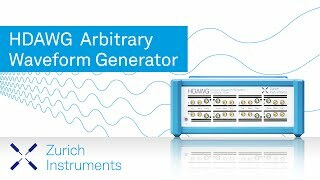 With the highest channel density and the most advanced synchronization features on the market, the HDAWG Arbitrary Waveform Generator is the first choice for applications of up to 64 channels. The superior noise characteristics of the 2.4 GSa/s, 16 bit signal generation and an ultra-low trigger latency allow you to push your measurement setup to new levels of performance. The LabOne control software provides an intuitive and efficient way of programming arbitrary signals.